3rd branch of the popular ‘Hotel Skypark Myeongdong’ group opened! 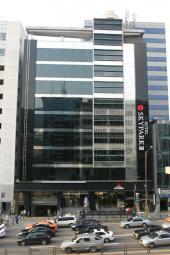 Hotel Skypark Myeongdong 3 opened in summer 2011 as the 3rd branch of the Hotel Skypark Myeongdong group, the most popular hotel group in Myeongdong area. The hotel consists of 136 rooms and the rooms are equipped with TV, closet and refrigerator as well as basic amenities. You can enjoy the view of Seoul tower from some of the window rooms. Rooms are relatively larger than existing hotels in the group. Bathtub and shower toilet are equipped in the bathroom and the shower booth is separately equipped in triple rooms for group visitors. The hotel run restaurant is in B1F, and the famous bakery franchise ‘Paris Baguette’ is in 1F. Seven-Eleven is also in located in 1F to make your stay more convenient. 3 computers with internet access are free for use at the front lobby. Besides them, suitcase scale, tour guidebook, map of Seoul city are prepared for visitors. The hotel is located in the heart of Myeongdong area, a doorstep from Myeongdong station, subway line 4. Subway line 4 offers an easy access to major sightseeing attractions such as Namdaemun market, city hall, Jongno, Chungmuro and Seoul tower.